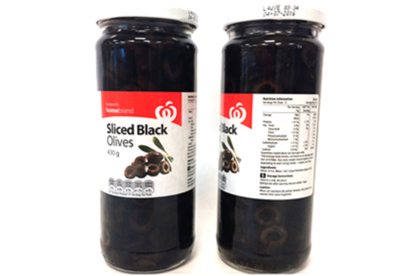 Woolworths Homebrand Sliced Black Olives may contain glass. Note: This recall initially only affected product with a specific best-before date but has been extended to include all batches and best-before dates. This product has been sold in Countdown, Fresh Choice and SuperValue supermarkets throughout New Zealand from 14 August 2014. Customers should return the product to their nearest Countdown, Fresh Choice or SuperValue store for a full refund or phone 0800 40 40 40 with any queries.